CAMBRIDGE — Matt Keegan, in his stellar exhibition at Harvard’s Carpenter Center for the Visual Arts, examines the particularities of perception, the interchange between individual and society, and the fluidity of language and other systems that define cultures. 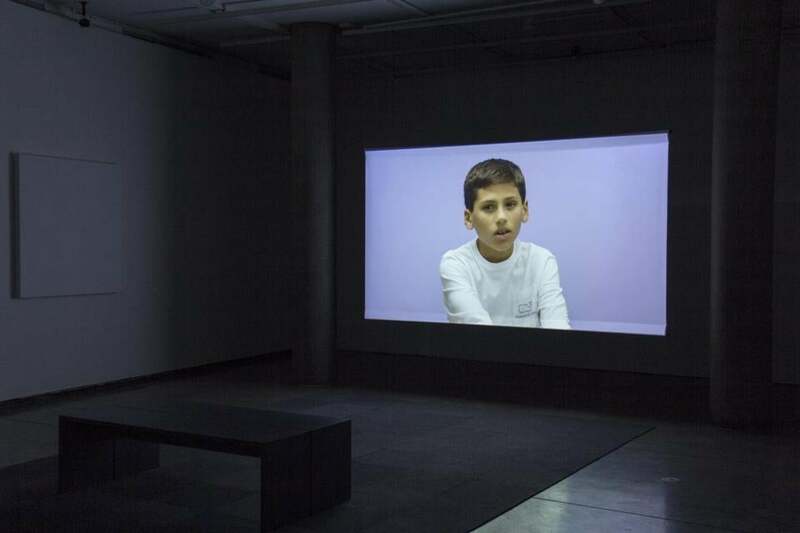 The show’s heart is “Generation,” a two-channel video in which the artist interviews members of his own family. In one video, he tosses out words such as “race,” “mother,” and “anger,” and family members free-associate in response. Sometimes Keegan asks a respondent to visualize a word: its shape, its color, and its solidity. The artist animates the result on the opposite screen, distilling perception into symbol. One niece imagines “home” as a turquoise arrow at rest. These animations take shape before our eyes, suggesting anything can change; and even though this family shares a common culture, it’s pliable and evolving. Keegan’s investigation extends to sculpture. He came up with the form of “Cutouts (Echo),” a pair of large, powder-coated steel wall works, by simply folding and cutting sheets of paper, in the manner of making paper snowflakes. The steel sheets, one blue and one burgundy, are much bigger and much heavier than paper, and jut gently from the wall. Audio murmurs and clangs. Artist Sergei Tcherepnin composed it from a recording of Keegan banging on the pieces, and it sounds like the inner monologue a steel sculpture might have if it could think. There’s a sense, in their near likeness, of the delicacy of an individual (like a snowflake) and the compelling magnetism of the tribe (like steel). Like siblings, they tense against one another, yet they need one another. Keegan finds the sweet spot that honors both, and that guarantees both will continue.